I love fragrant outings in unknown territories… It means I can act clueless. My plan (scheme, actually) early one December was at once evil and genius. I would wander around promoting the idea that I had never worn a fragrance (despite the fact I was lingering around with both arms full of wonderful smelly things) and ask for advice. I began at the YSL counter, with a pretty and impertinently disinterested young girl manning the register with an older lady doing her own thing. After looking at the bottles for about 5 minutes hoping she would come on over to help, I had to verbally nudge her for assistance. I told her the exact specifications of my wants. I wanted a fragrance because I felt I was now age-appropriate to wear one, and I wanted it to be a little different from the rest. Whilst I understood YSL was not the sort of house to deal with younger clientele, it was a challenge that was invariably pleasing to watch. She recommended M7 Oud Absolu, which I actually already owned (of course I did not disclose that information). This was particularly meritorious on her part, and I had mentally given her kudos. I told her it was not to my liking nevertheless. She then, as I expected, went through the whole ‘L’Homme’ range which I find a little tepid for my tastes. Perfectly nice, but nothing that knocks anyones socks off. I dismissed these also. 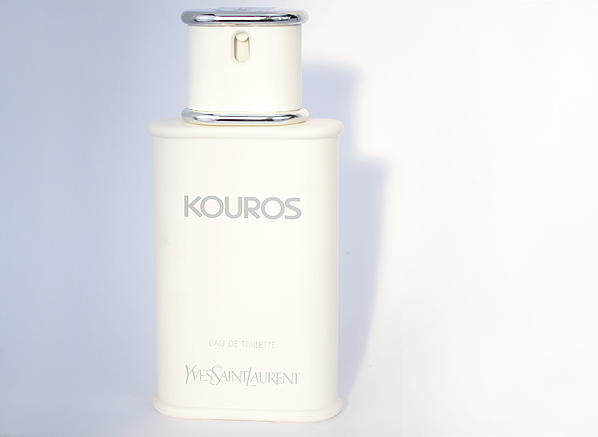 Nevertheless, saving the best for last, I had decided to be a little sly and enquire about this foreign looking, observably dated fragrance called “Kouros” (Pierre Bourdon – I love you). Her stoney gaze was priceless when I enquired. It was the perfect combination of repulsion, fear and warding. Her eyes widened, she was in shock without me even smelling it. “Oh dear. No, no, no.” she firmly said. Without her knowing that I adore the genius of making a fragrance that resembles urinal cakes, I persisted and demanded I smell it. Picking up the bottle with intense concentration, it was as if she was holding something of superlative fragility and of feather brittleness. She had sourced a blotter and stretched her arms out far away from her nose, and spritzed once. She handed me the blotter, and I raised it under my nostrils. I took a whiff. Dirty. Dirty. Dirty. Kinda delicious. I took another whiff, and let out a grin surprisingly not forced like hers. I was in heaven. “I love this” I proclaimed. Her facial expression was a clear ‘what the hell’ as I waxed lyrical about this fragrance. In retrospect it was all a bunch of exaggerated, quasi-grandiose verbal diarrhoea. I told her it was amazing, sophisticated, and burley. She still had no clue. I particularly remember saying something along the lines of “This suffers from a horrible condition called deliciousness, and I could sprinkle this with the same generosity as sugar”. She legitimately told me not to be silly, and handed me the coffee beans. When I had talked earlier about Antaeus by Chanel, I recalled my pride in finally being able to conquer the scent. The officious and oily scent of castoreum found in abundance in Antaeus was placed on the skin with immense happiness. Its tightness had diffused on the skin and its undergrowth of warmth and animal facets smoothed marvellously. The ‘kicker’ with Kouros however is that in place of castoreum we get a wealth of civet, spread on like good French Lescure butter on toast. Of course it’s French: it’s grand and it’s civet – a notoriously challenging (and now) synthetic note when used up front, that is generally more readily accepted when used in the background of symphonic florals or classic feminine scents. In Kouros (with much delight I have an original vintage bottle), the civet is compounded with the overloaded yet shimmering accord that was a paradigm for the time period: artemesia and coriander seed. This is dry and wet. Cool and hot. A civet note liberated with aromatic flounce. A traditional creme from a cat’s backside modernised. The ripe smell of a man and golden bodies juxtaposed with dark alleyways and vegetation. Without a doubt this is unsettling, and largely unbalanced at this stage. A spice feature is urging to rise up top but the animalics just won’t let it at this stage. Instead the spices are forced to pan out. Medicinal clove, funky patchouli, warm cinnamon – it is classic solid construction. The best part? There is something ingenious about the smell of a clean male bathroom – orange flower, aldehydes, and bergamot then fragmented with the illusion of masculine bodily warmth: civet, ambergris, spice, and jasmine indolics. I confess however, I find this fragrance to be very clean smelling – a sultry animal feature that is protecting. A muskiness that comes across as human. I give this time and this fragrance cools. Dried flowers and incense mainly contributing to the scent of an unwashed pair of underwear or a sweatshirt. Layered with vanilla, it achieves the effect of an attempt to coverup smell with another smell rendered pleasant. Say, spritzing fragrance onto a sweaty male armpit. This stuff gives you big balls. This entry was posted in Yves Saint Laurent and tagged civet, Fragrance, fragrance review, Perfume, perfume review, pierre bourdon, Review, scent, YSL, Yves Saint Laurent. Bookmark the permalink. Great reading Liam, you are a cheeky bugger! Incidentally, the SA’s response when you requested to sample Kouros, is exactly what I experienced at the Clinique counter when asking for a tester of Aromatics Elixir. You’d think I’d asked for a cup of plutonium the way the SAs eyes widened in horror. They conferred briefly and dug out a hidden tester from the back of a cupboard, before asking with genuine concern “have you tried this before?” They sprayed a blotter at arm’s length before quickly sealing it in an envelope “so as not to contaminate your handbag” and advising me to not smell straight away but try it in an hour. I’ll never forget their worried looks as I walked away bemusedly, the AE infused blotter like a ticking time bomb in my purse. To me, Kouros is a fragrance belonging to a time when chest hair and big sideburns were celebrated as the epitome of manliness (think Burt Reynolds in his prime). It may sound cliched, but I definitely recall it being a favourite of the chain-wearing Greek and Italian guys of my youth, with all non-Mediterraneans settling on Brut. I tested it a year or so ago and would actually consider wearing it myself (I’m a woman at an age where I don’t really give a stuff about fragrance conventions) though it really is potent and I’m not sure I actually need those big balls. Funny to read about AE. You know, that’s something that makes me nervous. I must revisit! My grandfather wore/wears this (Greek). Although on him it’s just clean barbershop and an intriguing trail. Thanks for coming along to the blog too! Appreciated greatly. Cute story you undercover operative you. I was around for the birth of Kouros and it is quite different from the animal it has morphed into. I don’t know how vintage your vintage is, but original Kouros was quite the honey bomb! While Antaeus went with bee’s wax, Kouros went for the honey and it was quite an oddity. It smelled like nothing else had smelled insofar as male fragrance was concerned. I was a an Antaeus guy myself. I went with beauty over the beast. Today I find the completely overhauled Kouros to be very nice indeed and quite wearable. It echoes its roots in the nicest way possible. It is still in production and one of the few fragrances that I rarely see available for a substantial discount which tells me it is still quite popular. Heck there’s a bottle next to my sink as I type. Gonna go spritz some on now! Very interesting actually. I didn’t even make mention of honey but it’s so obvious! [Gives a wonderful smoothness]. I am also an Antaeus guy, if I had to pick one over the other. Good taste! I hope the spritz has been worthwhile. Enjoy! I loved Kouros back in the day though I never knew a soul who wore it. I’d stop by the fragrance counter at the mall and spray a tissue and wander around sniffing it. Today’s version is still nice but I’m not as smitten with it as I once was. I find if you go and seek out some older Estee Lauder scents the SA’s have a similar horrified reaction. I love my vintage batch. It’s so warm and cuddly at times. The new stuff loses that feature, which is undoubtably very sad. Yes, Estee Lauder SA’s are always so very ‘odd’ to me… I must take a bottle of Youth Dew or AE and spritz it on them by accident! Did she really tell you not to be silly? Even if you deserved it, I’m not sure I’ve ever met a SA that bold. Usually, in my experience, they pretend to agree with everything you say, even though you know that inwardly they are rolling their eyes and saving up the anecdote to tell their friends later (‘I had this, like, crazy young guy today who, like, went on and ON about this, like, totally horrible fragrance … I even thought he might actually, like, BUY it .. ewww … ). This anecdote is an AFN favourite / classic Anne-Marie! I assure you, it really happened. You should have seen her faces of disgust… Oh well, it’s not that bad. I stirred her just as much. I sincerely hope she does talk about me! That weird man-boy who likes the smell of urinal cakes ;). I have only recently returned to Kouros for the first time since way back in the day and have fallen in love with it all over again. It does have a slightly different smell than I recall, a somewhat synthetic smell at the top that reminds me of celery seed. But that fades rather quickly after which it is basically the same old Kouros. That being said, I have read so much of the internet hand-wringing about the decline/demise of this polarizing scent that I currently have a imprudent bid in on Ebay for two partial bottles of lot 2 Kouros. Fingers crossed. Best of luck to you my friend. eBay is a dark and scary place.